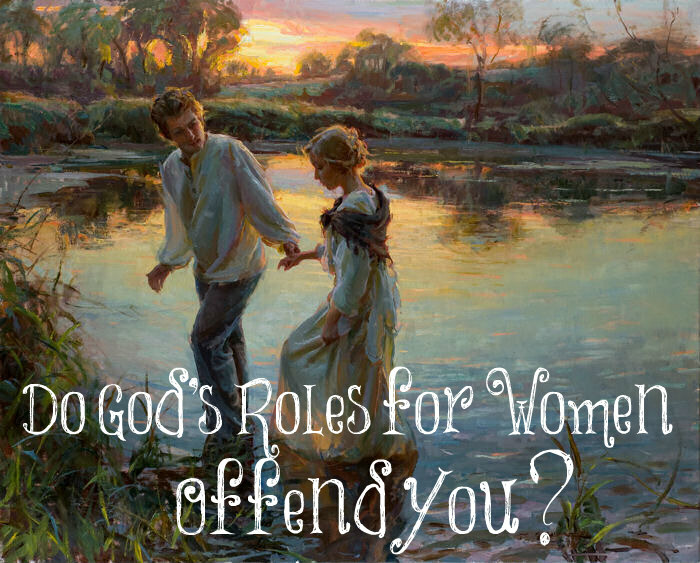 Why are so many women offended by the Lord’s will for them? Why are they offended with the concept of submission and the husband being the head over the wife? Why are they offended because women must be silent in the church and not teach nor be in authority over men? Why are they offended that God calls younger women to be keepers at home and doesn’t call them to careers and fulfilling their dream? Why is there so much hatred directed towards those who teach these truths to women? These women must see that most marriages are not good today. Seventy five percent of divorces are initiated by women. They must see this as a bad thing. They see the children of divorce suffering from not living under the same roof with their mother and father but being shuffled from house to house. They see wives who are manipulative and controlling towards their husbands and must think it looks ugly. They see women who are exhausted from trying to hold down a career along with a family and keeping a home. They have to see the ugly fruit from doing things opposed to God’s plan for women, yet they don’t seem to be able to connect the dots. I asked the women in the chat room if they have ever been offended by any of God’s instructions to women because I know I never have. He created us and knows what’s best for us. No, I didn’t always live them out perfectly, but I know they are perfect. Most of the women in the chat room have never been offended by them either. They also love the Lord and His ways. Some of them didn’t know or understand godly womanhood but since they’ve come to understand and apply it to their lives, they see a huge difference in their marriage and in their lives! How about you? If you are a believer in Jesus Christ, do His ways offend you? If so, you need to examine yourself to make sure you are in the faith. The Lord’s ways are perfect for us! And, no, I am not offended by them but blessed indeed!🙂American women today, for the most part, are very gullible. They have been deceived by the modern world and follow the humanistic mindset. II Tim. 3:1-6 spells out precisely what men/ women will be in the last days. People NEED the LORD. Thanks for posting today, Lori, and encouraging our feedback. I have always loved the woman’s role from childhood. I was a girlie girl as long as I can remember. I played dolls and carried my babies in my bike basket all over the neighborhood. I took care of them like they were alive. I told my husband back in the early 80’s when we were dating that I wanted to be a housewife. I wasn’t going to be one of those career women that worked all the time. He agreed. He said one of the reasons he married me was because I listened to him.n After we married a few years I became bitter towards him because he wasn’t meeting my expectations. We almost divorced a few times, but God kept us together. I had to learn Bible submission and forgiveness. When we were young, all of our friends ended up divorced except for us. I know the grace of God and living the roles God has given us, has kept us together all these years. God’s role for women never offended me but I used to be confused. I used to think that God knew times would change so He changed His mind. I used to think that since times changed He “understands” so it’s “okay ” to go outside His Word. Wow was I ever wrong! I’m glad I decided to obey God in this area. I also rejoice when I meet other women who are obeying the Bible. I am so over that word, “offended!” People are so easily offended nowadays that just the word causes me to roll my eyes and shake my head to be honest. . . But to answer your question, no, not “offended,” but confused. Once God convicted me of how I was treating my husband and not submitting to his authority in our family, I went to the Lord and told Him honestly, that word “helper” makes me feel “less than.” Then I looked up the word “helper” and discovered it is the same word in Genesis when God made Eve to be Adam’s helper as the Psalms, when we call on God to be OUR helper. It hit me like a ton of bricks: when I call on God to help me, I certainly don’t think of Him as “less than!” That cleared up any confusion I had about my roll in our marriage. Wonderful sentiment here, Traci, thanks for sharing it! And wonderful post, Lori, thank you, also – stopping by your blog is always like a breath of fresh air! I really enjoyed the painting you chose for this post, too. I’m behind on your blog and trying to catch up. I feel as Kareena who wrote, “I felt relief. Being surrounded by feminist, I always felt something didn’t sit right.” I, too was confused by feminism. When I was a young wife and mother it was still accepted for a women to stay home and I loved my role as nurturer and homemaker. But in the late 70’s I felt the pull around me to go to work. I worked on and off in the 80’s and early 90’s but it didn’t feel right to leave my home everyday and leave my children. I was lucky as my husband was a farmer and was there for them but no one was there for him. I began working less and less and could see that those days when I was home I felt more natural in my role. I also became more active in church work but never to the detriment of my family and home duties. When I began reading Lori’s blog my eyes were opened to the whole idea of God’s plan for me. I had heard the occasional sermon on submission but never took it to heart like I have after studying Lori’s blog and recommended readings. I am so thankful for her stand against the rampant feminism in our world today. Thanks, Lori, you made me see the “light”! The light of His perfect plan for us as women of God. Ok so I could use some help from all of you. I have teenage daughters and need help as to helping them understand or how to explain not so much of man is head of house but more about women’s role in church as teachers and workers and pastors. Also what about in the music ministry? Any help, thoughts, resources would be much appreciated.